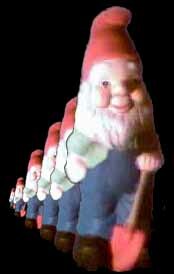 Contrary to what has been reported by Yahoo7, The Gnome Rangers have not declared war, there is no dispute regarding responsibility for "the gnoming phenomenon", nor are there any plans in place for a "retaliation gnoming mission" This is an unfortunate and inflammatory misrepresentation of our statements. While we did not choose to name specific people or organisations in our video statement, many people (including our own media liaison at gnoming.net) have pieced together the source of our concerns as well as the source of the recent gnoming incidents. 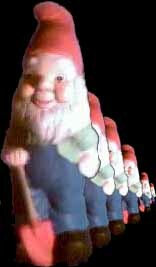 As previously stated, The Gnome Rangers hope that the community continues to embrace the humble garden gnome - we only wish to express a desire that those who follow in our footsteps conduct gnoming in an anonymous and socially inclusive manner - free of the politics of business group allegiances and commercial self-promotion. We are delighted at the community response to the reappearance of gnomes in Blackwood this year, most especially because we are not responsible for these silly acts. It has always been the objective of The Gnome Rangers not only to commit acts of silliness ourselves, but to inspire them in others. We confess to a measured sense of pride in knowing that our mission has given rise to a community-led resurgence of gnome-related whimsy. We hope that the community will continue to embrace the humble garden gnome as its preferred roof ornament for many years to come. For as long as that is the case, our work here is done. It is unknown when The Gnome Rangers will be meeting, what action they might take or when, but the following predictions are offered: eventually, something silly, when they get around to it.